ClubCoins Needed: 180 Games are not compatible with mobile and tablet devices. Please add this title to your Wish List and sign on to your the first club account from a desktop computer to complete your redemption. NOTICE: A persistent internet connection and The Elder Scrolls® Online account are required to play. Also includes The Elder Scrolls Online: Tamriel Unlimited. About the gameThe Elder Scrolls Online: Morrowind is the next Chapter of ZeniMax Online Studios’ award-winning online RPG, The Elder Scrolls Online (ESO). This new adventure will return Elder Scrolls fans to the legendary island of Vv… ardenfell, the same iconic environment featured in Bethesda Game Studios’ genre-defining open world RPG, The Elder Scrolls III: Morrowind. Introducing an enormous new zone, a new player class, more than 30 hours of main story content, a new Trial, and a new three-team, 4v4v4 PvP mode, The Elder Scrolls Online: Morrowind will be the biggest addition to The Elder Scrolls Online yet, offering a new adventure for ESO veterans as well as a fresh Elder Scrolls saga for players new to the game. Key Features A New Elder Scrolls Online Chapter For Everyone The Elder Scrolls Online: Morrowind redefines the traditional MMO expansion by delivering vast new content and features that are equally accessible and fun for both existing and new ESO players. New Players: New players can jump into The Elder Scrolls Online: Morrowind and start a new character without having to complete any previous ESO content. And, since the original ESO game is included with The Elder Scrolls Online: Morrowind, new players will have instant access to hundreds of hours of additional adventures throughout Tamriel. Existing Players: ESO veterans will be able to upgrade and immediately journey to Vvardenfell to start the new epic adventure. With the power of October’s One Tamriel update, existing players will find level-appropriate content from the moment they step onto the island of Vvardenfell, regardless of level. Existing players can also choose to create a new character and begin anew. Haven’t played ESO in a while? : The Elder Scrolls Online: Morrowind is a great chance to jump back in with your existing characters, or with a completely new one. 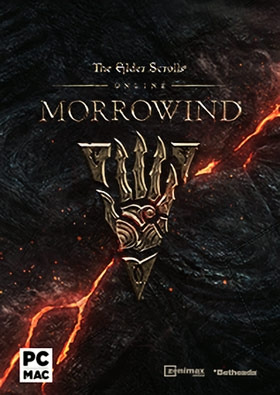 Because ESO has no required subscription, you can just reinstall the game, log in, and start playing again.Return to MorrowindVvardenfell is the largest zone added to The Elder Scrolls Online since launch and utilizes the same geographic footprint as The Elder Scrolls III, including all key points of interest from the classic game. Players will embark on a dangerous journey through legendary locales in Vvardenfell, 700 years before the events of The Elder Scrolls III, from the docks of Seyda Neen, to the volcanic Ashlands, to dense, mushroom-filled forests, and through the glory of Vivec City, still under construction in this time period. New Class – The WardenPlayers will harness nature-based magic to master the powerful new character class - The Warden. The Warden is the first new class since the launch of ESO, and true to ESO and the Elder Scrolls franchise, the player will have the freedom to select from a number of abilities that enable a variety of play styles. The Warden also introduces a devastating new combat ally – the War Bear – a ferocious fighter that will stay by the Warden’s side through the most intense battles.An Incredible Elder Scrolls StorySet roughly 700 years prior to the events of The Elder Scrolls III, The Elder Scrolls Online: Morrowind will take gamers on a sweeping adventure through the legendary Vvardenfell, featuring iconic locations, characters, and storylines that will instill nostalgia with longtime Elder Scrolls fans and extend ESO’s narrative into a new chapter. Morrowind is in dire peril and it’s up to player heroes to help Vivec, the legendary warrior-poet and Guardian of Vvardenfell, solve the mystery of his mysterious illness, regain his strength – and save the world from ultimate destruction. New PvP Mode - BattlegroundsThe Elder Scrolls Online is renowned for open world PvP battles, pitting hundreds of players in a massive battle for supremacy in Cyrodiil. The Elder Scrolls Online: Morrowind will introduce a new PvP mode – Battlegrounds – with intense 4v4v4 battles in arena-like environments. Players take the battle to the Ashlands to claim their place among the fiercest and most accomplished combat veterans in Tamriel. System Requirements Windows - Minimum Operating System: Windows 7 32-bit Processor: Intel® i3 or AMD 3870 generation processors or higher Memory: 3GB System RAM Hard Disk Space: 85GB free HDD space Video Card: DirectX 11.0 compliant video card with 1GB of RAM (NVIDIA® GeForce® 460 / AMD Radeon™ 6850) Sound: DirectX compatible sound card Internet Broadband Connection	Mac - Minimum Operating System: Mac® OS X 10.9.0 Processor: Intel® Core™ 2 Duo Video Card: NVIDIA® GeForce® 460 or AMD Radeon™ 6850 (1GB of VRAM) with OpenGL 4.1 Memory: 4 GB System RAM Storage: 85 GB free HDD space Internet Broadband Connection ©2017 ZeniMax Media Inc. The Elder Scrolls® Online: Tamriel Unlimited™ developed by ZeniMax Online Studios LLC, a ZeniMax Media company. ZeniMax, The Elder Scrolls, ESO, ESO Plus, Tamriel Unlimited, Bethesda, Bethesda Softworks and related logos are registered trademarks or trademarks of ZeniMax Media Inc. in the US and/or other countries. All Rights Reserved.